It has been three days since Alyona Zagoyeva has eaten or slept. After a weekend spent huddled in the dirty basement of her Tskhinvali apartment building with 20 of her neighbors, she seems exhausted and has to hang on the door handle for support. Her eyes blaze with anger, however, when asked about what she has seen. "Georgians aren't people," she said. "They're animals. We just want to thank Presidents Medvedev and Putin for their help. Our hope is that one day we'll be able to return to our homeland." 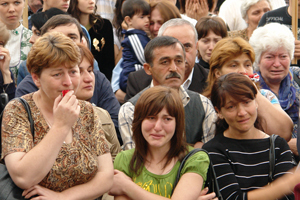 As thousands of refugees continue to flee the devastating violence in Georgia's breakaway republic of South Ossetia, that anger is increasingly being projected abroad. Egged on by sometimes inflammatory Russian media reports of the fighting, something approaching anti-Western hysteria is starting to take hold among the population here. In dozens of interviews across the Russian republic of North Ossetia over the last three days, locals and displaced people vented their anger at what they see as the havoc caused by American and European regional machinations. Standing by the side of the Zaramakh Highway, now marked heavily with tank treads, Pyotr, a 60-year-old vendor selling grilled meat in the Ossetian style, thinks that he has the conflict all figured out. "Every country wants to look out for its own interests," said Pyotr, who refused to give his last name. "There's gas and oil down there and access to the sea. That's why the West wants to take it." And what about Russia's interests in the region? "In Putin's country, he already has everything that he needs," he said, adding with a laugh, "and you have less of it." Georgian President Mikheil Saakashvili is largely reviled throughout the area, where he is perceived as little more than a Western stooge. The incorrect opinion that Georgian soldiers have been laying siege to Tskhinvali with U.S.-made artillery is heard everywhere. There is even a popular rumor here that U.S. soldiers are fighting alongside them. The scale of the destruction caused by the fighting in South Ossetia is another factor driving anti-Western sentiment. Russia claims that 30,000 South Ossetians have been made homeless in the fighting, although the figures are impossible to verify. As the refugees enter Russia, they bring with them stories of misery and suffering. "I saw a car full of women and children on the street in Tskhinvali," said a refugee who gave her name only as Tatyana. "They just shot them. They were just sitting there, and they shot them." Stories like Tatyana's can be found everywhere here. Pyotr Bezhov, a Russian peacekeeper stationed in South Ossetia who fled the violence along with his daughter, Oxana, on Sunday, described with horror the sights he had seen inside Tskhinvali. "I saw a car stopped in the middle of an intersection," he said. "Inside, there was a mother, father and their two children. They were all dead. A tank just shot them." Roughly 60 kilometers from the border, the Alansky Convent has been converted into a makeshift refugee camp. Nearly 40 children and their families now live in shared housing, with no prospect of leaving. Tseresa Konbegova, 34, was at home in Tskhinvali when the fighting began Thursday. They had no idea that the fighting would begin so quickly, she said. Still, she believes that the fighting could easily end as quickly as it began, given the right motivation. "If America told them to stop fighting tomorrow, they would," she cried. "Look. We have beautiful children just like yours. All we want is peace in South Ossetia." Russian authorities have barred foreign journalists from entering the conflict zone, making it difficult to report on conditions on the ground. The grizzly images carried back with the Russian journalists who shuttle across the border with no restrictions only add to the anti-Western sentiment. State-owned Vesti television has been running 24-hour coverage of the fighting and humanitarian disaster inside South Ossetia for several days. Graphic images of the dead and the wounded run beneath slick animated graphics of explosions. Not everyone agrees with the prevailing opinion, however. Tearing down a narrow dirt side road in his aging Soviet-made Zhiguli, Ruslan Didoyev recalled with glee the illicit transmissions of Radio Free Europe that he listened to in his youth. "It's not about East versus West. It's not about Bush versus Putin," he said with a sigh. "It's about what happens when a people are split apart."